D. Gause has been active as a musician for over three decades on the Las Vegas Strip as a conductor, keyboardist, and clarinetist. Among her many engagements, she has been the principal clarinetist for The Phantom of the Opera as well as keyboardist for many hit musicals such as We Will Rock You and Mamma Mia! Dr. Gause has earned four academic degrees and is also a multiyear recipient of grants from the National Endowment for the Arts. She currently serves as a Professor at the College of Southern Nevada. In addition, Dr. Gause performs regularly as a soloist, chamber musician, and orchestral musician in addition to touring with Clarion Synthesis and has performed throughout the U.S., Canada, Cuba, Central America, Europe, and Japan. Her students at Kessler & Sons consistently earn superior ratings at CCSD’s Solo and Ensemble Festival. With her duo, Clarion Synthesis she has performed throughout the U.S., Canada, Europe, and Japan. 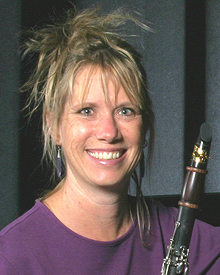 At the College of Southern Nevada, Professor Gause teaches studio clarinet and piano as well other music courses online to students worldwide. If you have any questions about lessons with D Gause, please feel free to submit them in the form below!